Mortality, a life threatening condition. I posted this earlier in the year and didn’t tag the post, so it remained buried in the archives since then. I’m reposting as a response to ‘Versatility’ anxiety (see here and here). lapping at the edge of land. The above picture is a combination of photography and digital painting. The text is part of the picture and I have included it in the event you cannot read it in the picture. Its a comment on modern society. Especially the obsession with physical appearance which we see everywhere today. Films, TV, advertising, its everywhere. The human form is presented, flawless as a classical statue. The feeling of being physically inadequate must haunt the susceptible. Especially the young. Even though we know that photographs can be ‘Photoshopped’ we subconsciously accept the image as real. I think this media was appropriate for this ‘painting’. 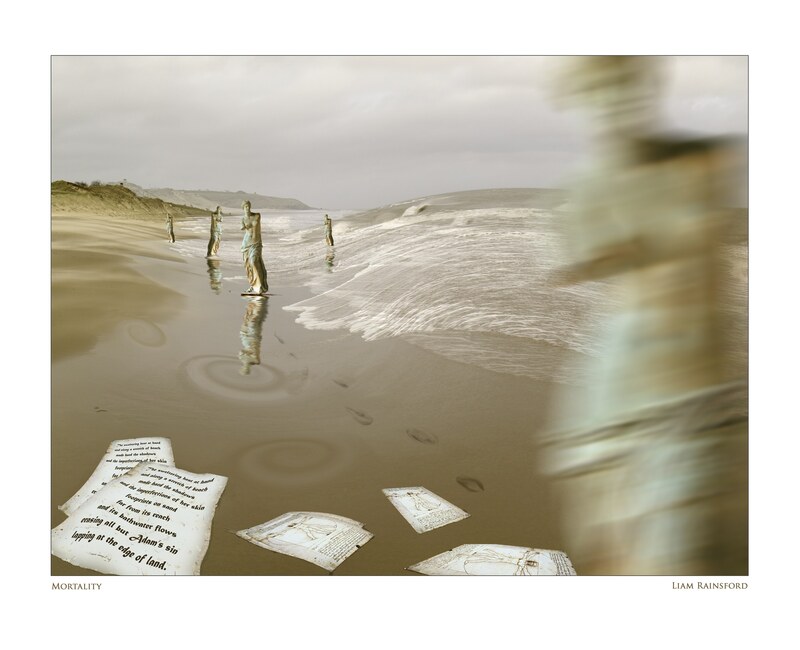 the beach litter – Leonardo’s da Vinci’s The Vitruvian Man. Vitruvius (born c. 80–70 BC, died after c. 15 BC) described the human figure as being the principal source of proportion among the Classical orders of architecture (Wikipedia). The computer application used was Photoshop, appropriately. This entry was posted in Digital Painting, Photography and tagged Art, Culture, Digital Painting, Education, Inspiration, photoshop, Poetry. Bookmark the permalink. Beautiful and poignant. I love your work. very well done. more appropriate now than ever before. Thanks Mary, happy Christmas to you and all. Lovely post – our souls are the truly beautiful part of us…. This is quite a comprehensive blog–I’m so happy to report that I agree with all the advice you give to the beginners! So often painting is approached with no structure whatsoever and little advice as to color handling and what different mediums can accomplish. Thanks for “liking” my blog so I could find you! This is powerful, & I really find the image & the processes used, interesting. Am glad you are sharing some of your poetry & digital images as well as your wonderful oil painting & techniques. Really love this piece and, of course, many others! Truly inspiring! Creative but also true…nothing is as it seems. We must go deeper.